One of the curious aspects of microbial ecosystems compared to those of larger motile organisms is the apparent lack of an optimal swimming speed. It has often been stated that the energy spent by microorganisms on swimming constitutes only a minute part of their metabolism (e.g., Refs. [52,53]). In light of this, it should always be advantageous for microorganisms to swim as fast as possible because increasing their swimming speed will increase the contact rate with prey and thus the feeding rate. In spite of this, there are large differences in swimming speed between different species within the same size class and feeding on the same prey. The extent of this cannot be explained by differences in drag of the feeding apparatuses, as even within species that do not have retractable feeding structures, large variations in swimming velocity occur . This variation should provide a firm basis for natural selection toward higher swimming speeds. So why do many microorganisms still swim relatively slowly? One answer could be to reduce the probability of being preyed upon themselves. Contact rates between predator and prey are dependent not only on the swimming speed of the predator, but also on the swimming speed of the prey . However, flagellates often seem bottom-up rather than top-down regulated (e.g., for instance Refs. [10,56]). Furthermore motility, while increasing the contact rate, may decrease the interception rate, hence in reality potentially providing protection from predation . Thus, this does not seem to be satisfactory as the only answer. where P (J s-1) is the average power consumption, r (m) is the radius of the organism, ^ (N s m2) is the viscosity of water, and U (m s-1) is the swimming speed of the organism. is a nondimensional parameter defining the swimming efficiency of the organism. The optimal (smallest possible) value of that is achievable for a given organism depends on factors such as relative size of the cell body and relative length and width of the flagellum. The larger the cell body or the thicker the flagellum compared to its length (L), the less the possible efficiency. Whereas an organism with L/r = 10 and r = 50 x the radius of the flagellum can, in principle, achieve an optimal of 125, an organism with the same radius of the flagellum but L/r = 5 will not be able to do better than a of 210. The actual value of for a given organism can in principle range from this optimum to infinity, depending on flagellar parameters such as amplitude and frequency . The value will only approach infinity if, for instance, the amplitude of the flagellum is going toward zero, resulting in very inefficient swimming. (cv r + i where I (particles s-1) is the ingestion rate, C (particles m-3) is the concentration of food particles, V (m3 s-1) is the volume of liquid that passes through the area swept for particles over time (V = UA, where A is the area swept for particles), and i (s particle-1) is the time it takes for the protozoon to ingest one food particle. I have assumed the following: The bacteria have a radius of 0.3 ^m and are similar to E. coli with 26% of their volume composed of organic compounds, of which 8% is lipids and 92% is other organic compounds . The energetic value of lipids is taken to be 37 KJ g1, and the energetic value of other compounds is taken to be 17 KJ g1. The bacteria do not swim. The protozoa have a radius of 3 ^m, and the flagellum has a length of 30 ^m and a radius of 0.1 ^m. At these values, the energetic optimum of the organism lies at approximately = 150. The protozoa are assumed not to spend any energy on motion while in the process of ingesting a particle, and when swimming, do so close to their energetic optimum. They can ingest 60% of their volume per hour in accordance with the data in, e.g., Ref. , giving an average ingestion time of 6 sec. 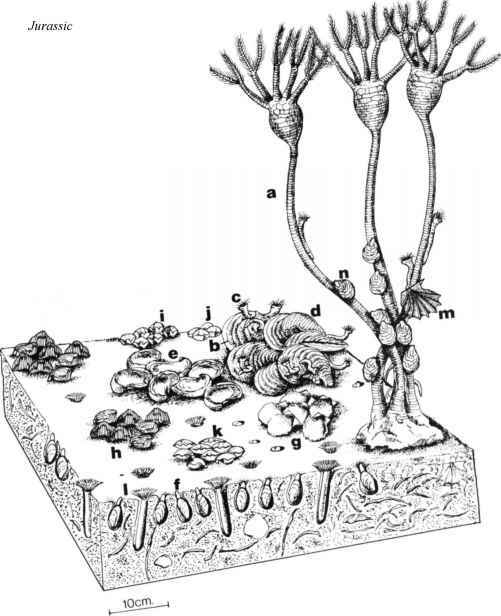 Ingested carbon not used in respiration for the purpose of motion is used in growth, with a growth efficiency of 40%. In this case, A is assumed to be equal to the transectional area of the body of the protozoa, as is seen in P. vestita . From these assumptions, I have calculated the growth rate of the protozoa as a function of swimming velocity at different bacterial concentrations (Figure 13.5A and 13.5B). FIGURE 13.5 Theoretical growth rate of protozoa as function of their swimming speed at bacterial concentrations of (A) 1011 and 1012 bacteria per cubic meter and (B) 1013 to 1015 bacteria per cubic meter. is effectively zero until the velocity is 180 ^m sec-1, with a small optimum of 1.85 x 10-4 hr-1 at 91 ^m sec-1. At velocities above 180 ^m sec-1, the growth rate becomes increasingly negative. 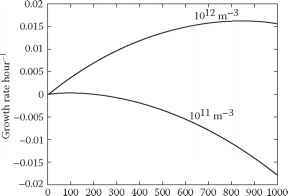 At 1012 particles m-3, the growth rate increases to a maximum of 1.61 x 10-2 at a velocity of 850 ^m sec-1, then decreases again. 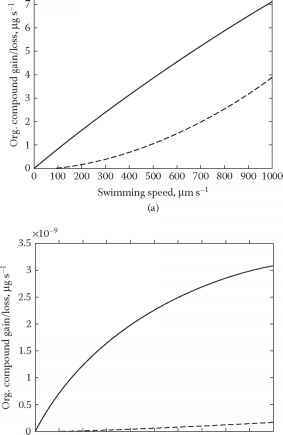 At higher particle concentrations than this, the growth rate increases continuously with velocity for realistic values of potential swimming speed. 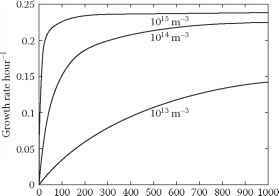 The value however reaches an asymptotic value toward the maximum growth rate and so, after the asymptotic level is reached, a further increase in swimming speed does not significantly increase growth rates. The growth rates found are well in accordance with previous values obtained experimentally of growth rates for the given particle concentration (e.g., Refs. [52,60]. As mentioned earlier, in aquatic systems, bacterial concentrations are typically around 0.5 to 3 x 1012 bacteria m-3. Based on this, one would expect protozoa to swim at higher velocities than the 150 to 300 ^m sec-1 commonly observed for protozoa not hindered significantly by feeding structures. However, as is discussed in Section 13.5.2, bacteria in the ocean are not uniformly distributed but accumulate in patches that can have concentrations orders of magnitude higher than background concentrations [61-63]. An individual protozoon in an environment with an average bacterial concentration of 1012 bacteria m-3 will rarely experience this bacterial concentration at any given time. More realistically, we may imagine that the protozoa experience a lower background concentration of say 1011 bacteria m-3 with small patches of highly elevated concentrations, say, 1014 bacteria m-3. At the low background concentrations, swimming speeds above 180 ^m sec-1 will give the protozoa increasingly negative growth rates, thus, not allowing it to survive as long and lengthening the recovery time when it once again encounters higher concentrations of food. It should be noted, however, that the magnitude of the negative growth rate is exaggerated because protozoa undergo physiological changes that enable them to survive when starved . At the higher patch concentration, swimming speeds above 300 ^m sec-1 will only benefit it little. Hence, under these conditions, one would expect the optimal swimming speed of the organism to be below 300 ^m sec-1, in accordance with what is actually observed in nature. Because of the heterogeneous nature of the food resources, however, no single swimming speed is always optimal but will vary continuously with conditions. Every possible concentration between 1011 and 1014 bacteria m-3 will be encountered by the protozoa at some stage. This explains the high variation seen within these organisms when it comes to swimming speed; there is no unidirectional selective pressure. This is enhanced because swimming serves not only to directly enhance encounter rates with food particles, but also to move to and locate areas of higher food concentration (see Section 13.5). Whether this increases, decreases, or leaves unaltered the optimal swimming speed for a given organism depends on its abilities to orient itself to stimuli and its mechanisms for doing so. FIGURE 13.6 Amount of carbon compounds gained through ingestion (solid lines) and lost through respiration (dashed lines) as a function of swimming speed. Bacterial concentrations: (A) 1012 bacteria per cubic meter and (B) 1013 bacteria per cubic meter. as CO2. It seems that the potential importance of the energetic balance involved in motion of the individual protozoa so far has been underestimated, and it may be an important shaping factor in microbial ecosystems.